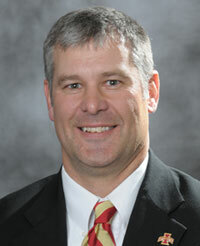 Iowa State football coach Paul Rhoads says their is a sense of urgency surrounding spring drills for the Cyclones. After taking the helm following Gene Chizik’s departure to Auburn, the coaching staff is installing a new system and a different philosophy as the Cyclones look to improve upon last year’s 2-10 record. Rhoads says they have a lot to learn and they continue to learn about the players and team, and the players are learning from the coaches. He says they have to learn schemes and philosophies, but he says the players have taken that to heart. Rhoads says the players have been receptive to changes. For many of the more experienced players this is their third different coaching staff. He says they have to convince them another new way is the way to do things, and he says there’s a natural tendency to fight. Rhoads says he asked the players to not put up a shield to the new ideas, and overall he says the players have not done that. Rhoads says it’s hard to be told that you are wrong and the way you are doing something is not right. He says the biggest surprise thus far is the way the players have accepted the changes. Iowa State’s spring game is April 18th.